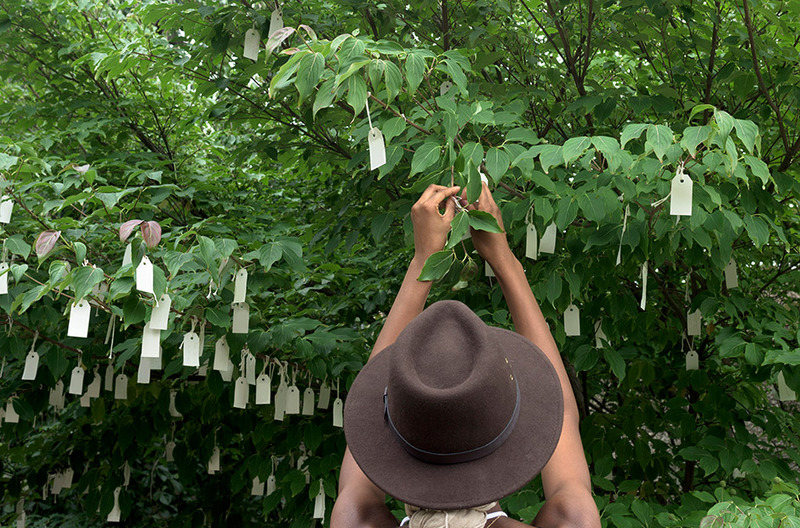 In celebration of the tenth anniversary of Yoko Ono’s Wish Tree for Washington, DC, the Hirshhorn will present a selection of the artist’s most iconic and emotionally charged installations and performances. Beginning June 17, in addition to having the opportunity to attach handwritten wishes to Wish Tree, visitors will be able to pay tribute to their mothers through My Mommy Is Beautiful and view Sky TV for Washington, DC. The focus will culminate in September with a daylong concert featuring Ono’s music. A gift from the artist in 2007, Wish Tree is a perennial favorite at the Hirshhorn. Over the past decade, nearly 80,000 wishes have been collected and sent to Ono’s Imagine Peace Tower, an outdoor artwork in Iceland that memorializes John Lennon. By tying handwritten wishes to the branches of the Japanese Dogwood, visitors can once more contribute to Ono’s international effort to promote peace and prosperity. Spanning the length of the Museum’s lobby, My Mommy Is Beautiful will join the Wish Tree as another of Ono’s interactive artworks. The forty-foot long installation invites visitors to bring a photograph or write a thought or memory about their mothers and attach it to the canvased wall. Ultimately, the wall will be obscured by layers of memories and images, thus unfolding a spirited and monumental tribute to mothers around the world. What is more, Ono’s Sky TV for Washington, DC (1966), a twenty-four-hour live feed of the sky outside, will be reinstalled on the Museum’s Third Level. Conceived during a time when Ono lived in a windowless apartment and dreamed of having the sky inside, Sky TV was one of the first works of art to harness the instant feedback capability of video, acting as a timely commentary on technology’s replacement of nature. The anniversary culminates in a daylong concert in September, featuring Washington-based and national musicians, who will present their variations of Ono’s works and their own pieces inspired by her key role in performance history. A precursor to contemporary Noise music, Ono’s concerts and recordings from 1960 onwards set the scene for experimental music and vocal techniques. As the national museum of modern and contemporary art, the Hirshhorn showcases the ways that artists respond to the world around them. Ono joins the Hirshhorn’s 2017–18 schedule of diverse contemporary artists whose work reflects the global conversations that shape history, politics, and culture. Best known for her conceptual installations and experimental music, Yoko Ono (b. Tokyo, 1933) is a Japanese American performance and multimedia artist whose work is strongly influenced by feminism, human rights, and peace activism. She has had retrospectives in New York at the Whitney Museum of American Art (1989), the Japan Society (2001), and the Museum of Modern Art (2015); as well as in Germany, the United Kingdom, and Spain. In 2009, she received a Golden Lion Award for lifetime achievement from the Venice Biennale. Curated by Mark Beasley, Curator of Media and Performance Art with curatorial assistance from Sandy Guttman.